Most western Christians don’t realize that our understanding of man’s state of sinfulness — sometimes using terms like “total depravity” and “original sin” — is largely the invention of Augustine of Hippo, and that the majority of the Church at that time rejected his ideas. The Eastern churches still do. The doctrine of Original Sin, by the way, is more than just believing that man is born with a tendency toward sin. It is also that man inherited the guilt of Adam — something the Bible doesn’t teach. This is why some believe that babies are born guilty, so if they die before they are baptized, they won’t make it into Heaven. Personally, I think it’s enough to be guilty of my own sin. Those of you who have followed this blog for any period of time might recall that I have in the past discussed various issues with what is known as the Penal Theory of the Atonement, which also arises from Augustine’s thinking. I’ve never claimed to be an expert on the subject, and I haven’t come to any final conclusions, except that the concept of the Father taking his anger out on Jesus because he needed someone to punish seems quite out of character. Also, I’ve raised issues with the Augustinian / Calvinist notion of Total Depravity, which also seems contrary to Jesus’ attitudes toward people. Augustinian theology causes other problems, too, as discussed in the following video by an Orthodox Priest out of Canada. He brings out a number of very interesting points that I think Protestants should at least consider, such as the impact on the Church’s response to science and how Augustinian theology relates to violence. In fact, the Orthodox view seems to resolve a number of the issues often raised by atheists. I think the video is worth 15 minutes of your time. If you do watch it, I’d really be interested in your responses. This entry was posted on Friday, September 2nd, 2011 at 11:36 amand is filed under . You can follow any responses to this entry through the RSS 2.0 feed. You can leave a response, or trackback from your own site. I don’t think he fully understands “Total Depravity”. It was never postulated that mankind is “fully evil” but that every single part of a man is corrupted. No part is untouched by Adam’s sin, so I don’t think it’s a fair comparison to say that this doctrine, which does appear in Scripture (none are righteous, no not one), leads to denigrating others or leads towards violent. Rather it breeds a common sense of humility and need for salvation from our sins, which only comes from being given a new heart of flesh and losing the old heart of hardened stone. I always considered Sin leading to breaking community with God, and losing the conditional immortality of remaining with the Tree of Life. I don’t count myself “evangelical” nor am I unwilling to critique Augustine, but this doesn’t seem to be the best critique. Though opening the challenge to rethinking what Adam had done is always helpful. The words of those who’ve gone before are guiding lights to understanding Scripture and drawing closer to the Word of God, Christ Jesus. True, but isn’t that because we need to unpack what Paul is saying when he speaks about death being the ‘final enemy’? Good question. Although, those of us who now claim eternal life – restored relationship with God – still die a physical death. 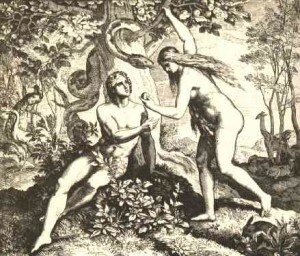 When God informs Adam and Eve in Eden that they would ‘die’ – the word means ‘put to death’ (as in killing or slaying) – the common word for this used throughout the Old Testament. Paul’s term for death in Romans can be used figuratively (Romans 6?) or literally (Romans 5?). When comparing Adam with Christ, is he not using the terms (“life” and “death”), not only to speak of union (or separation), but of actual physical demise due to the fall and immortality due to Christ’s work? The concept of “death” presented here – as not meaning physical death, but “separation from God” – is the concept I was raised with. It wasn’t until I ran into fundamentalists did I hear the understanding that nothing was meant to physically die until Adam sinned (I still wonder why Eve gets a pass). The issue of inherited guilt becomes a big deal when you start picking apart RC and Calvinist theology of the atonement, and then of course all of Calvinism seems to fall apart at that point. I’m eager to view part II of this, to see where else he goes. Romans 5:12 boldly states that “sin entered the world through one man, and death through sin, and in this way death came to all people.” Whether or not “guilt” is a part of our Adamic inheritance seems to me ultimately a moot point. Death, with or without guilt, is still death. Love the discussion and the long-awaited new post. Thanks for posting, Alden – it raises lots of questions, not sure it answers many…. different species of humans (pre-eden? ), created mortal, then subject to death (which appears to be entirely natural), some pretty obscure ideas on sin (guilt – is this a ‘meme’, a feeling, or an actual human state?) and evil. I certainly don’t find Augustine correct on much here, but I didn’t really find any deeper answers in what was stated. Reading Robert Farrar Capon’s ‘The Third Peacock’ certainly gives a very different approach on such matters (not happy with everything he says either, but it certainly gets you thinking! ), and at least people like William Dembski (in ‘The End of Christianity’) are seriously struggling with such matters. It would be great to have an honest and open symposium with people from a range of views on this.